Click here for an updated round-up of Christmas cookies from around the world. On the first day of Christmas Cookies, my true love made for me, Dark Chocolate Mint Sandwich Cookies. During the year, whenever I have a really bad day, and as I am telling my husband ALL about it, he knows exactly what to do. He picks me up a bag of Peppridge Farm's Mint Milanos. Of course I share one cookie with him, I couldn't quite possibly finish the whole bag myself, now could I. With the Holiday season, I'm getting into my baking mode, and I thought what a great way to start than to make something with Dark chocolate and mint. And these cookies are Super Simple to make. If you have your own Sugar Cookie recipe you could make homemade ones, but I just picked up some premade Sugar Cookie dough at the store, a bag of dark chocolate chips, and some heavy cream. 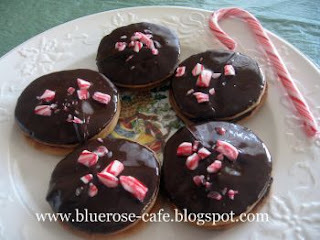 I all ready had some peppermint extract at home, and some candy canes or peppermints to crush. By adding 1/4 cup of flour to the cookie dough, it makes it easier to roll out on a floured surface. I rolled the dough out to a 1/4-in and used a small round cookie cutter to cut out 24 cookies. Bake them at 350F for about 8 minutes, and then let them cool for about 10 minutes. While the cookies are cooling, melt 1 cp of the chocolate chips with a 1/4 cup of heavy cream, and then you add 1 tsp. peppermint extract. One of my favorite smells of the holidays is mint. It just smells so fresh and clean. If you are not a huge mint fan, you could use either orange or almond extract instead. Not to get off the subject, but every year I just have to go buy at Trader Joe's, some chocolate orange candies. Ah, they are so wonderful. I have the hardest time just eating one. After the cookies have cooled, using a teaspoon, flip a cookie over, and place a small amount of the dark chocolate mint ganache, in the center and top with another cookie. Slightly pressing down, so the ganache fills the whole cookie. Chill in the freezer for about five minutes, so the filling will stick to both sides of the cookie. While those are chilling, in a bowl, melt the remainder of the chocolate chips with 1 tsp. of vegetable oil. Microwave for a minute. Give them a stir, until all melted and looking silky smooth. Slowly take a cookie, and barely dip the top of the cookie, covering it with the melted chocolate. Top each cookie with some crushed peppermint, slivered almonds, or candied oranges. I had to post on here because I was thinking of doing the same kind of theme on my blog! I mean about 12 different types of cookies for Christmas. Unfortunately, I never got my act together. :o) I will probably end up with that many posts about holiday cookies, though! These look great, as do the raspberry ones.